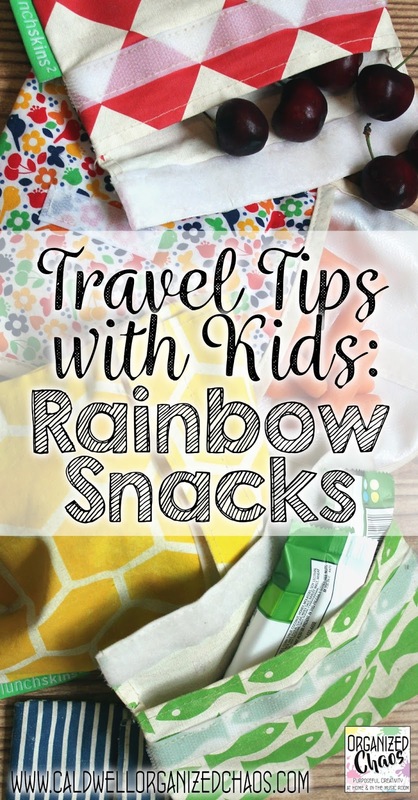 As we gear up for summer travel, I wanted to share a fun tip to help pass the time on long trips with kids (whether you're on the road or in the air). 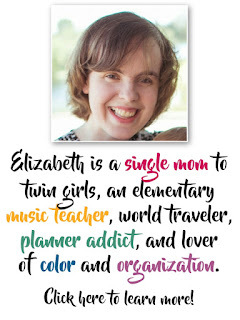 It helped make my road trip with two 4-year-olds much more enjoyable last year and I plan to use it again when we fly across the country in a few weeks! I came up with this idea because 1) I love focusing on the color of foods- it has made my daughters much better eaters and it makes everything more fun (and usually healthier too), 2) I know that on long trips it helps to have things to look forward to throughout the trip, and 3) when it comes to travel you can never have too many snacks. 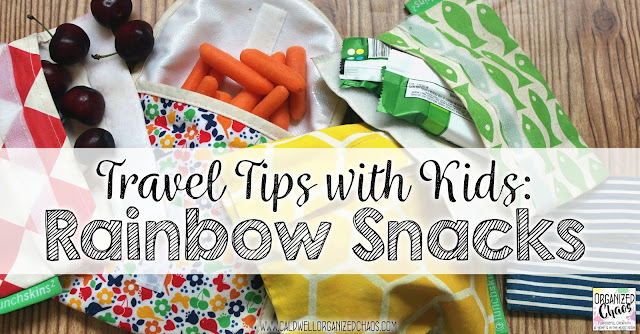 The basic idea of Rainbow Snacks is to pick 1 food item to go with each color of the rainbow: red, orange, yellow, green, blue, purple, and pink (you could add white as the "clouds" if you need another one) and pull them out one at a time in rainbow order for everyone to eat, spaced out over your trip. The first thing to do is figure out how many colors you'll need (depending on the length of your trip). If you have a 3-hour trip, you could do 6 items (one every 30 minutes) by ending with purple, for example. For preschool age, the 30-minute time worked really well. For older kids you could space them out more, even one each hour, for longer trips. The main thing is to try to have a predetermined time for each one so that everyone can anticipate when the next one is coming! The second step is to choose one food for each color. I tried to have a mix of fruits and vegetables, protein and/or savory, and 1 or 2 sweet treats, but making sure I only included things that everyone would *actually* be excited about (my kids are great eaters and they'll usually eat asparagus for dinner without complaint, but I don't think they would get that excited if I pulled it out as a "special surprise" on a road trip!). Here's a list I came up with, but obviously there are any number of options! Remember to think about package colors and not just the color of the food itself. You'll need to have each food packaged in its own container so you can pull each color out separately. I put everyone's food for each color in one container for everyone to share, but you could obviously package every person's food individually if it's hard to share on the trip. I have a collection of reusable snack bags (like these) that I used for this because a) I can package each food in a bag of the same color so I know which is which and b) nobody can see the food inside. As long as you can keep track of which is which though, the packaging is obviously not too important. Of course there are a few extra considerations you'll need to be aware of if you're flying- basically you'll want to make sure everything is contained and that you don't have any liquids. Here's a little more detail on that if you're flying in the United States. All of the foods I've mentioned here should be safe to bring through airport security. How do you make long trips with young children more bearable? Leave your tips in the comments below! 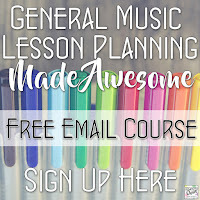 I can always use more ideas and I'm sure other readers would appreciate your tips too! 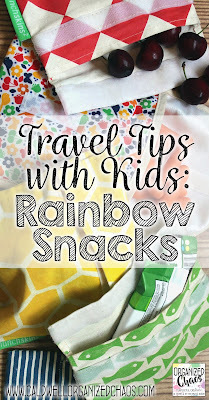 If you want packing tips for traveling with children, here's my post on that. Happy trails everyone! Want more? Sign up here for the Organized Chaos Newsletter and get more ideas and resources sent straight to your inbox!